This entry was posted in Uncategorized and tagged illustration, Simpsons, The Cure on May 6, 2016 by Josh Latta. Grandpa gets a second career as a mope rocker. This entry was posted in illustration, sketchbook and tagged Morrissey, Simpsons on January 26, 2016 by Josh Latta. As always, thanks again, Allen. This entry was posted in avatars and tagged avatard, illustration, Simpsons on January 9, 2016 by Josh Latta. Raging Abe Simpson and His Grumbling Grandson in “The Curse of the Flying Hellfish” is more Barks-like than all Don Rosa’s duck comics combined. This entry was posted in illustration and tagged illustration, Simpsons on June 17, 2014 by Josh Latta. From all of us in Lattaland, to all of you that crapped out a baby, Happy Mother’s Day! This entry was posted in Uncategorized and tagged Mother's Day, Simpsons on May 11, 2014 by Josh Latta. Not to be confused with the style of any other popular cartoon. This entry was posted in avatars and tagged avatard, avatars, Simpsons on December 6, 2012 by Josh Latta. My man Zack here appears to come from the land of a 20 year old property. Let’s just keep in mind that you can’t copyright a style. Right? This entry was posted in avatars and tagged avatard, Simpsons on April 30, 2010 by Josh Latta. Lookout! It’s another Simpson- I mean, “yellow with an overbite” commission. This entry was posted in vector art and tagged Simpsons on December 9, 2009 by Josh Latta. Drawing eleven dudes is never that easy of a task, unless of course you draw them yellow with an overbite. Oh sure, these might superficially resemble Simpsons characters, but what can you do? 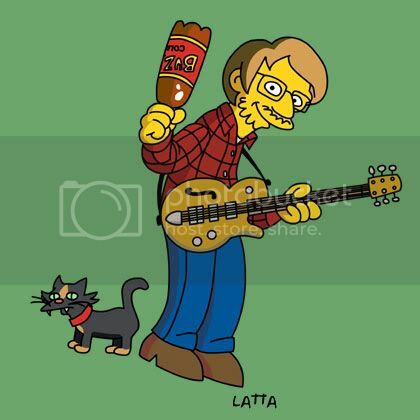 This entry was posted in illustration, vector art and tagged Simpsons on December 2, 2009 by Josh Latta. So, you guys gettin’ all worked up over the fact that the BJM is coming to your jerkwater town? You should be, not only will original members Matt Hollywood and Joel Gion will be there, but you can also buy the old-school-stadium-tour-style-tee-shirt I illustrated slash designed for this joyous occasion. This entry was posted in illustration, t-shirt and tagged band, Brian Jonestown Massacre, Simpsons on March 18, 2009 by Josh Latta.